The human heart is a vital organ that pumps blood throughout the body, supplying each organ with oxygen and nutrition. At the same time, the heart carries away oxygen-depleted blood from body tissues. The heart muscle constantly contracts and relaxes ensuring this process is constantly repeated. 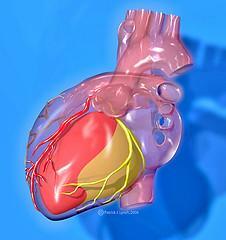 Also, there are different processing units within the heart that help the pump to perform its task. In this article we will discuss about the coronary artery which supplies blood to the heart. The heart muscle has four chambers, namely left and right upper chambers called atria and left and right lower chambers called ventricles. There are also four valves that regulate blood flow through the heart muscle. They are the mistral, aortic, pulmonary and triscuspid valve. Blood vessels called veins branch out of the upper and lower chamber of the heart. They transport blood rich in carbon dioxide and cellular waste from different body parts into to the heart. This deoxygenated blood enters the right atrium to be carried to the lungs via the right ventricle. From the lungs, oxygen-enriched blood is returned to the left atrium and left ventricle to be pumped to the rest of the body via the aorta. The aorta at its base divides into two coronary arteries which supply the upper and lower body. These arteries are positioned around the heart muscle and provide it oxygen and nourishment. The right coronary artery supplies the right side of the heart while the left artery provides for the left chambers. The left coronary artery (LCA) divides into additional arteries, the circumflex artery (Cx) and left anterior descending artery (LAD), which carry oxygenated blood to the left atrium and left ventricle. The right coronary artery (RCA) also has smaller branches, which supply blood to the right atrium, right ventricle, atrioventricular node and sinoatrial node (group of cells that control heart rate). These vessels are the acute marginal arteries and the right posterior descending vessel. Other branches of the coronary artery are the acute and obtuse margibal vessels, the posterior descending or PDA vessels, septal perforator and diagonals. These smaller branches serve as additional sources of oxygen-rich blood reaching the heart. The coronary artery is the structure vital for normal functioning of the heart. On the other hand, if this artery is damaged different heart problems may occur as the heart muscle cannot receive enough oxygen and nutrients. This may lead to a heart attack and even death.